TJ Rampit USA has been in business for over 20 years and its team has over 100 years of combined experience with ramps. Started in 1992 by Ted Short Sr. and his son Ted Short Jr., the Short Family and its team at TJ Rampit have been committed to providing the best quality ramps, service and support. As the second largest ramp manufacturer in the country, the dedication to its customers and expertise with mobility products is felt throughout the entire company. From the front desk to the warehouse, each team member has personally participated in installing a ramp for a customer. This is been a company practice from the beginning and has given the team members the ability to understand and provide the best service to its customers. In addition, many of the team members have been able to see not only how easy it is to install, but to experience the impact of giving freedom and mobility to countless people who otherwise are homebound or experience extreme difficulty leaving their home. This is just one of the reasons why BLVD is featuring TJ Rampit as a featured company on our blog. We are excited to share what we have learned with our readers. Manufactured in Cold Water, Michigan, all of TJ Rampit materials are made in the USA and can be shipped anywhere in the country for local installation for your home or business. Offering two different types of ramps including aluminum and the wood aluminum ramp (WAR) combination. You can choose which type works best for your needs. 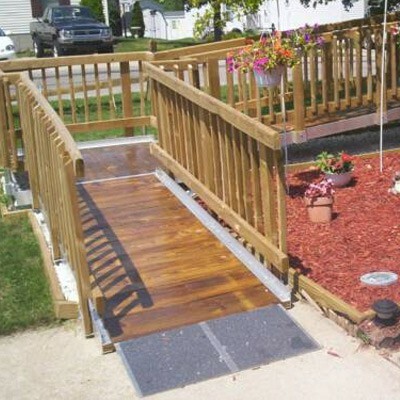 Each ramp is custom-sized and can be built to any and all specifications. You can also include custom handrails, steps and gates. All ramp systems are compliant with ADA standards to ensure safety for its users. TJ Rampit stands by its lifetime warranty so you can be sure you are getting a quality and safe product. Furthermore, TJ Rampit has put their products through rigorous testing, even up to 2-4 times the weight limit so you can feel confident in your security when utilizing the ramps. To learn more about their products, visit their products page. 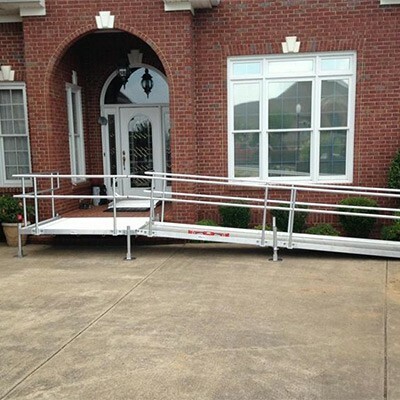 When looking for a modular ramp solution, timing is everything. In many cases, an injury or progressed disease has made a ramp an immediate need. TJ Rampit is able to turnaround a custom ramp in 1-2 business days for Michigan dealers and only 3-5 business days for dealers outside of Michigan. The best way to get a quote and custom layout is to contact TJ Rampit who will then be able to connect you with an installer in your local area. An assessment of your home or business will be able to provide accurate measurements and specifications for your needs. Installation can then take place in only a few short days. Renting ramps is also a great solution for short term needs and installation can be done at any time. Whether you are looking for inside or outside your home, TJ Rampit has a rental option to assist you with your mobility needs. The founder of TJ Rampit, Ted Short Sr., served our country and made serving Veterans a critical part of his company's mission. Today, TJ Rampit has customized and installed wheelchair ramps for numerous veterans. Working alongside the VA, TJ Rampit has been awarded a BPA (Blanket Purchase Agreement) to test the national implementation of a program that will give veterans free ramps that can be installed in the same day. Several veterans have already benefited in Michigan and the goal is to partner with every VA hospital throughout the country so that our heroes who have sacrificed have the accessibility they deserve. Certified dealers are located throughout the country and you can contact one by calling them directly at 1-800-876-9498. TJ Rampit is also looking for qualified individuals and companies to carry their products and provide installations. If you are interested, please contact them for more information. Follow TJ Rampit on facebook for the latest information and updates!